Note : This post will be edited again to make it more simple to read and to add more information. So please see again for the edited version. The circuit uses a Zener controlled relay driver to switch on/off the load. A 9 volt 500 mA Step down transformer provides power to the circuit. Any voltage drop in the Primary of the transformer reflects as a corresponding voltage drop in its secondary. So when the line voltage is normal around 200-230 volts, Zener conducts to bias the relay driver transistor T1.When T1 conducts (as indicated by the glowing LED), relay energize and switch on the load. 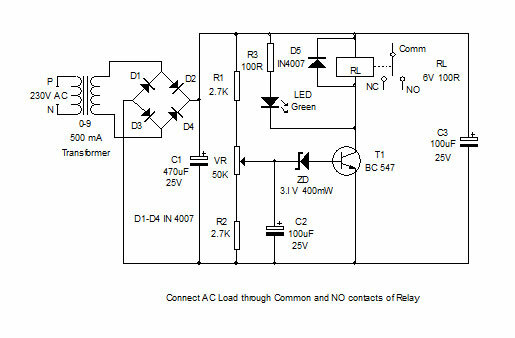 The load is connected through the Common and Normally Open (NO) contacts of the relay so that when the relay energize, the load gets power. When the mains voltage drops below 200 volts, a corresponding voltage drop occurs in the secondary of the transformer and Zener turns off. T1 then turns off to de energize the relay and power to the load breaks. The load remains off till the line voltage increases to normal. Capacitor C1 gives a short lag before the Zener switching to avoid false triggering of T1 when the line voltage fluctuates. C1 act as a buffer to maintain the voltage level at the cathode of Zener. It is necessary to adjust the triggering point using the preset VR. Check the line voltage and if it is above 200 volts, slowly adjust the wiper of preset till LED turns on and relay energize. Fix that position of preset for the preset voltage. When the line voltage drops, corresponding voltage drop also occurs in the wiper of preset that turns off the Zener. 1. Why flow of current from cathode to anode still the flow of electrons is from cathode to anode? The direction of current, according to convention, is the direction opposite the direction of electron flow. Remember that the anode is where oxidation occurs, so electrons are lost by the anode. These electrons then move from the anode, to the cathode by a wire that usually connects the two compartments. To reiterate, the electrons flow from the anode (site of oxidation) to the cathode (site of reduction). Because electrons flow from anode to cathode, by convention the direction of current is from cathode to anode (the direction opposite the flow of electrons). Hope this helps! 2. Why current flow from cathode to anode in zener diode? First off, I don’t know if by current flow you mean conventional current flow or electron current flow. You realize they are in opposite directions and most electronics engineers use conventional current flow in circuit analysis. Ignoring this, I will assume your real question is “Why does current flow backwards in zener diodes compared to ordinary diodes?” The answer is that zener diodes are not operated in the forward biased range as are ordinary diodes, instead they are operated in the reverse biased range. When reverse biased enough any diode reaches breakdown voltage and suddenly conducts. Most ordinary diodes can be destroyed by breakdown, but zener diodes are designed to tolerate it. In zener diodes, this breakdown is referred to as “zener breakdown” and the voltage it happens at the “zener voltage”. Low voltage zener diodes can still be used in the forward biased mode, like ordinary diodes. However most high voltage zener diodes have a “blocking diode” that is not documented on the data sheet to block forward biased operation. “Blocking diodes” are simply ordinary diodes wired in series with the zener; when the zener would be forward biased they are reverse biased (and thus blocking current), when the zener would be reverse biased they are forward biased. 3. Why flow of current from cathode to anode still the flow of electrons is from cathode to anode? 4. Is a zener diode a current limiter? No. A zener diode is a voltage limiter. Circuit design might create a current limiting response, but the basic control is voltage, not current. 5.What does mean by reverse bias diode? Forward conduction voltage can vary between about 0.6 volts and about 1.4 volts depending on the diode and the current. Also, some diodes, such as zener diodes, will conduct in the reverse direction. Reverse bias is simply where the anode is more negative than the cathode. In the agriculture field, so many farmers are suffering from the low voltage problem, with the motors burning away more frequently. For the Air-conditioners, there are Buck-Boost stabilizers are available. Why not that kind of stabilizers or other types be used to protect the interest of the farmers? Do the circuit given by you cater to their needs? If so, please tell us how, and also, why cant’ we assure the Agriculture depts. regarding this? If I am not away from the path of this article, I solicit your reply. Voltage drop is a major problem in many plases especially during the peak hours. In our place, the Electricity board advices to switch off Fridge during the peak hours to prevent energy waste. As you know when voltage drops, current consumption increses especially in motor driven equipments. Voltage stabilizers can stepup the voltage only 5-10 volts and there is low/high cut off in stabilizers.It is better to avoid the use of current hungly equipments if the voltage is below 200 volts.The circuit can cut off the power supply if the voltage drops below the preset level. But if it is used in Motor, a high quality Industrial type relay is needed to handle the current.Connecting the motor in a Voltage stepup can solve the problem.